The Skinny: A pedestrian buddy cop comedy that totally goes nuts for the final action sequence. If you have the DVD, try A-B repeating the ending sequence during parties. 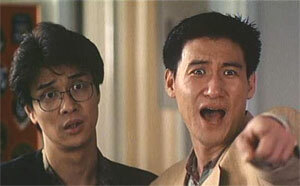 by Kozo: A fairly standard buddy action-comedy featuring Jacky Cheung and Stephen Tung as the two cops. Main plot: there are bad guys and the cops must catch them. That's it. The secondary plot is about the mainland cousins of Stephen Tung (Alfred Cheung and the ageless Loletta Lee) who visit the two cops for no apparent reason. Loletta and Jacky fall in love, much to Alfred’s dismay. However, he finds his long-lost love Bonnie Fu (who’s now a club hostess) during a routine investigation of a night club. Then there's action. Lots and lots of action. We mean it.